Each year we look at some of the most fun and most beneficial finds out there for both inspiration and for idea-starters for graphic designers. Here's an entire collection of images surrounding "Day of the Dead" celebrations. I think you'll have a lot of fun with : Photoshop Brushes, vector files, clip art, drawings, and fun coloring pages! This original collection features elaborately decorated skulls, dancing skeletons, and other charmingly macabre images from Mexican folklore. Decorate pillows, jackets, placemats, handbags, and other clothing as well as accessories and homewares with more than 40 classic Day of the Dead motifs, all of them new interpretations of traditional designs. Fast-forward to the fun part of machine embroidery with this playful collection of skulls and skeletons associated with Day of the Dead festivities. Eliminate the time-consuming efforts of finding and copying patterns from elsewhere with the 88 motifs in this CD-ROM and book set, which are optimized for embroidery digitizing software. Use your creativity to personalize each design by selecting size, colors, stitch types, and other elements. The book offers a visual index of the designs, showing each one in black-and-white and in different color combinations. Each design is offered on the CD-ROM in both JPG and EPS formats. Compatible with all major brands of embroidery software, these meticulously processed digital files assure accurate, self-contained stitch patterns. The suggested motif colorways are specified for threads made by Isacord; color conversion tables for other manufacturers can be accessed on the CD-ROM. The files can also be used in print and web projects. Created for use with the popular Photoshop and Photoshop Elements software programs, 130 large, finely detailed brushes and 40 custom shapes offer skulls, skeletons, and other images associated with a holiday that celebrates the human connection with the souls of the departed. Additional features include 20 texture brushes, 20 custom styles, an inspiring design gallery, and helpful tutorials. The enclosed CD-ROM features a robust selection of design tools including: Brushes: it's easy to create photographic and painterly effects as well as "rubber stamps"; Shapes: a quick way to add customizable vector shapes to your Photoshop compositions; and Styles: ready-to-use shadows, glows, bevels, color overlays, and other effects for the featured shapes. The Book includes an index of all custom brushes and shapes, instructions for loading and use, and a gallery of designs. The Day of the Dead, observed annually on November 1 and 2, offers the living a chance to remember and honor their departed friends and family. 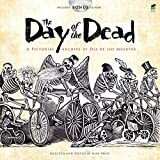 Inspired by the Mexican holiday, 31 intricate illustrations depict dancing skeletons, skulls, and other traditional imagery, all festooned with flowers, butterflies, and additional lively decorations. Pages are perforated and printed on one side only for easy removal and display. Specially designed for experienced colorists, Day of the Dead and other Creative Haven coloring books offer an escape to a world of inspiration and artistic fulfillment. SEE: Vintage Holiday Greeting Cards copyright free clip art ideas and inspiration on CD-ROM!